I Am No Role Model! 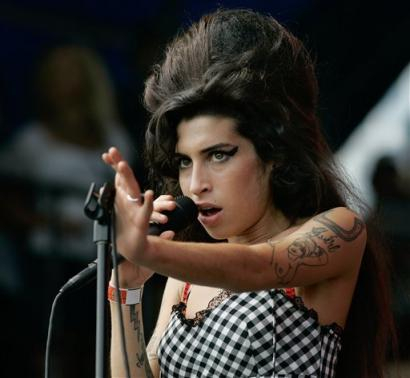 Amy Winehouse is a classic case of life imitating art. The 24 year-old singer, who also pens her lyrics, is encumbered with a slew of afflictions most of them underlined by drug addiction, apparent spousal abuse, chronic eating disorder, self injury tendencies, and depression. Fans have an opportunity to navigate the ups, but mostly downs of Winehouse’s troubled life by listening to the lyrics of some of her songs. On her latest album, one can juxtapose the words of ‘Back to Black’ with the tide of pictures depicting the singer in her most vulnerable moments splashed across tabloids and the internet. British gossip newspaper, The Sun, for example, plastered a photo of the five-time Grammy award winner, disguised in a blonde wig, smoking what the paper says is crack. And that did not surprise many given the clarity with which she expresses her familiarity with ‘puffing’ and ‘blowing’ in those lyrics. The words of ‘Rehab,’ the tune that rocketed Winehouse to world-wide stardom, is an artistic parody in which she expounds her tumultuous lifestyle in the same breath she eschews seeking the help she needs in order to contain and ultimately erase these demons. Following a clip in national British media, showing the blues singer walking the cold streets of London, at dawn, clad in her underwear her mother, Janis, wrote a heart-wrenching open letter to Amy, which was published in The Sun. Janis, who was estranged from her daughter at the time, jerked tears UK-wide when she beseeched Winehouse to get the help to which her family has been trying to lead her for a long time. This did very little to stem the self-effacing path that the talent-laced artiste continues to straddle. It seems she is unable to un-tether herself from the loam of misery that besets her. Adding to her high propensity to invite scandal into her life is her husband’s chain of ‘bad boy’ fracas, one of which landed him in jail late last year. Blake Fielder-Civil, who married Winehouse in a private ceremony in Miami last year, is often referred to as a facilitator of her problems. A known jail-returnee, Fiedler-Civil, who attempted to purchase the silence of a bartender who witnessed a brawl in which he was involved, also dragged his wife into temporary lock-up when Scotland Yard investigated the melee. Although Winehouse was later released, he was not. In the weeks that followed her husband’s incarceration, the singer melted into depression and cancelled a number of concerts, including her US summer tour. “I can’t do it without my Blake,” she said. It is as well-kown fact many artistes follow this sort of self-destructive lifestyle and when the storm clears, find a chart-smashing hit out of their experience. It does not help that celebrity scandal is a highly competitive profit centre that unfolds the worst moments of these troubled lives in real time for the world to see. A few months before this transpired, the couple – over-exposed in the media for their lust for lewd behaviour – were a staple in the press with disturbing pictures of both of them ‘bloodied and disheveled’ after a fight in their 550 pounds a night hotel suite. Winehouse, who was later seen cuddling her husband on an early morning walk, said she was the cause of the squabble. “Blake is the best man in the world. We would never ever harm each other.” The singer also said she was “cutting” herself when Blake discovered and the fight ensued. The couple was also slapped with drug possession charges in Norway. Given their sullied precedence, the US embassy in London denied Winehouse entry into the US to perform at the Grammy Awards. But that did not stifle the blues babe’s fame. Winehouse wooed Grammy audience with a live performance transmitted via satellite. And although she was visibly shocked by her Grammy sweep – which includes Song of the Year, Album of the Year, and Best New Artiste – her fans were not. The audience rumbled with cheers at every Winehouse victory, well all, except Natalie Cole. Cole, a respected R&B veteran, scolded the Grammy decision- makers for decorating Winehouse with the wins, citing that she is not a good example. “I don’t think she should have won. I think it sends a bad message to our young people who are trying to get into this business, the ones who are trying to do it right and really trying to keep themselves together,” Cole told People Magazine at a post Grammy soiree. “She shouldn’t have her cake and eat it too,” she added. Undoubtedly, Winehouse is among the most authentic singers in the business but seems to be stuck “in a place where” she “can’t get joy.” If she must live what she sings, those who really care for her would prefer if she experiments with disco in the interest of extending her life.